Nykaa.com, Sri Jagdamba Pearls, World of Titan! Catch the latest launches in the world of Gift Cards, brought to you by Qwikcilver – Everything Gift Cards! Amidst a great spell of rains across India, here we are bringing more developments from the world of Gift cards. Showcasing our future-ready and easy-to-launch solutions are the two new launches this month and an all-new cross-promotion venture with one of India’s most loved brands. On the corporate reward solutions front, we are pleased to highlight an innovative marriage of a unique consumer promotion solution and a cross promotion initiative. As usual, we continue to bring out some fabulous new offers on Woohoo with great brands. Do reach out to us to explore how we can join hands in making your Gift Cards irresistible for our consumers. Bouquets or brickbats, we eagerly look forward to all your feedback! A double launch announcement! One of our oldest clients have now updated their partnership with us by launching their brand new Physical Gift Card as well as the Nykaa Wallet program. The wallet program signifies that brands now want to be future ready and Qwikcilver makes that transition happen as smoothly as possible. The Nykaa wallet is now available on their app and will be soon integrated to their website experience as well. Nykaa.com is one of India’s premier online beauty and wellness destination. They offer beauty and wellness products for men and women with a hassle-free shopping experience. Their virtual makeover tool, beauty advice and assistance on the phone, free expert advice and articles on beauty trends and tutorials and celebrity looks have added immense value for the customer over the years. From the city of Nizams comes a Gift Card fit for royalty. We are pleased to announce for the first time ever, the launch of a Gift Card program for a brand synonymous with pearls and pearl jewellery – Sri Jagdamba Pearls gift card. Sri Jagdamba Pearls, famous for Pearls & Pearl Fusion Jewellery are one of the first retailers of Pearl Jewellery in the city of Hyderabad. They source the world’s best pearls and incorporate innovation & technology to maintain a high customer reach. With uncompromising customer service, convenient shopping modes, lifetime Pearl guarantee Sri Jagdamba Pearls offers their customers beautiful, unique, unmatched, and certified jewellery that can be worn during all occasions and all age groups. The latest in the list of our unique cross-brand promotion initiatives involves the retail arm of Titan Company Ltd. Yes! We are talking about the World of Titan. As a part of the initiative, every customer who makes a minimum purchase of Rs. 5000 at any of the World of Titan stores, receives a conditional voucher of some of the leading brands across categories such as Electronics, Travel & Hospitality, Apparel, Fashion & Accessories. The end consumers can redeem their vouchers at any of the stores of the respective brands. This cross-brand initiative highlights yet another capability of Qwikcilver in helping brands across categories engage with each other’s customer bases. Qwikcilver has designed a unique consumer promotion program for the client, who is one of the leading global electronics and home appliances company, with a significant pan-India presence. This consumer promotion program was designed for the client, as a run up to the Indian Independence Day falling on the 15th of August 2018. As a part of the program, every customer who makes a minimum purchase of Rs.25000 at any of the company showrooms, receives a mix of assured and conditional vouchers from some of the leading brands in India. Qwikcilver designed an end to end program which included cherry picked brands (plus their voucher offers) that would complement the client’s product offerings. At the other end of the spectrum, we provided the client’s consumers the option of redeeming the vouchers online from a custom microsite, in addition to redemption through physical means. The program allowed our client, as well as the participating brands, to engage with the customer and marry consumer promotion initiatives with cross promotion activities. In the month of June, Woohoo collaborated with leading brands to bring out some exciting offers as a part of the “Jolly June” campaign. The offers ranged from 5% to 20% discounts on brands like Cleartrip, SPAR, The Serai, BookMyShow and Thomas Cook. After a successful “Jolly June” we have “Joyful July” happening right now! Cleartrip, Spar, Sri Jagadamba Pearls, MakeMyTrip and The Serai are brands looking to attract consumers with their exciting offers! 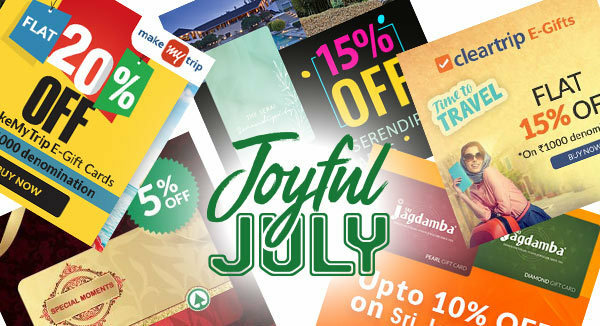 Check out all the “Joyful July” offers here.